Newly released Census Bureau data from the 2014 American Community Survey (ACS) shows that a record 63.2 million U.S. residents five years of age and older speak a language other than English at home. The number is up 3.6 million since 2010. The largest percentage increases from 2010 to 2014 were for speakers of Arabic and Urdu (Pakistan's national language). As a share of the population, more than one in five U.S. residents now speaks a foreign language at home. In 2014, a record 63.2 million U.S. residents (native-born, legal immigrants, and illegal immigrants) spoke a language other than English at home. That number is up 16.2 million since 2000, up 3.6 million since 2010, and up 1.4 million just since 2013. 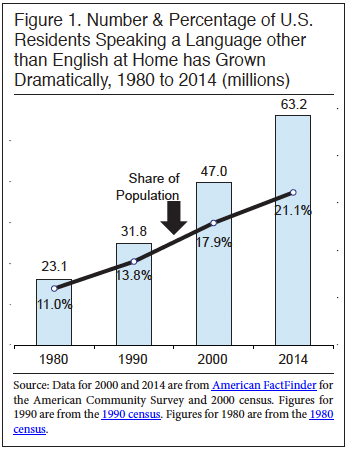 Taking a longer view, since 1990 the number of foreign language speakers has roughly doubled; the number has almost tripled since 1980. As a share of the population, 21 percent of U.S. residents speak a foreign language at home. The largest percentage increases from 2010 to 2014 were among speakers of Arabic (up 29 percent), Urdu (up 23 percent), Hindi (up 19 percent), Chinese and Hmong (both up 12 percent), and Gujarati and Persian (both up 9 percent). Urdu is spoken in Pakistan; Hindi and Guajarati are languages of India; Hmong is spoken in Laos; Persian is spoken in Iran. The largest numerical increases from 2010 to 2014 were among speakers of Spanish (up 2.3 million), Chinese (up 331,000), Arabic (up 252,000), Tagalog (up 115,000), Hindi (up 114,000), and Urdu (up 89,000). Tagalog is spoken in the Philippines. Languages with more than a million speakers in 2014 were Spanish (39. 3 million), Chinese (3.1 million), Tagalog (1.7 million), Vietnamese (1.5 million), French (1.2 million), and Korean and Arabic (1.1 million each). Of school-age children (five to 17), 22 percent speak a foreign language at home. 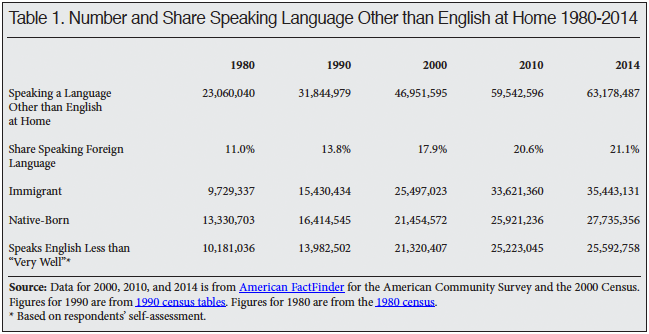 Of those who speak a foreign language at home, 25.6 million (41 percent) told the Census Bureau that they speak English less than very well. States with the largest share of their populations speaking a foreign language in 2014 were California (44 percent), New Mexico (37 percent), Texas (36 percent), Nevada and New Jersey (both 31 percent), New York (30 percent), Florida (28 percent), Arizona (27 percent), Hawaii (25 percent), Illinois and Massachusetts (both 23 percent), Connecticut (22 percent), and Rhode Island (21 percent). 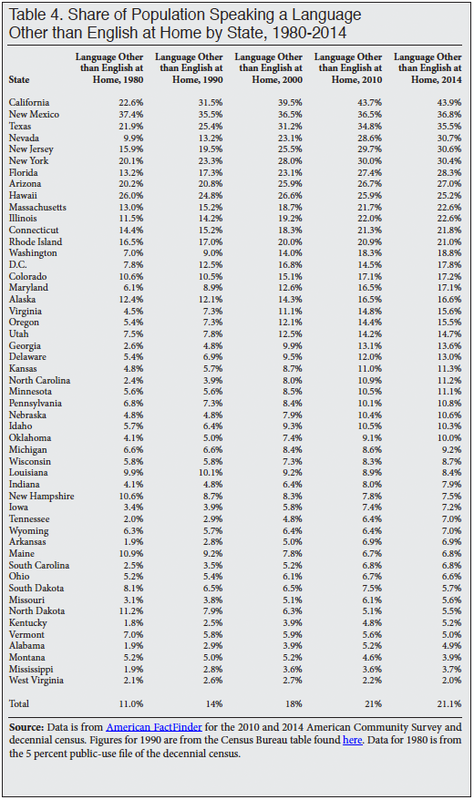 States with the largest percentage increase in foreign language speakers 2010 to 2014 were: North Dakota (up 18 percent); Wyoming (up 15 percent); Nevada (up 14 percent); Oklahoma and Tennessee (both up 13 percent); Delaware and Oregon (both up 12 percent); Kentucky and Utah (both up 11 percent); Virginia up 10 percent; Texas, Florida, and Georgia (all up 9 percent); and Minnesota, Michigan, North Carolina, Massachusetts, and Washington state (all up 8 percent). 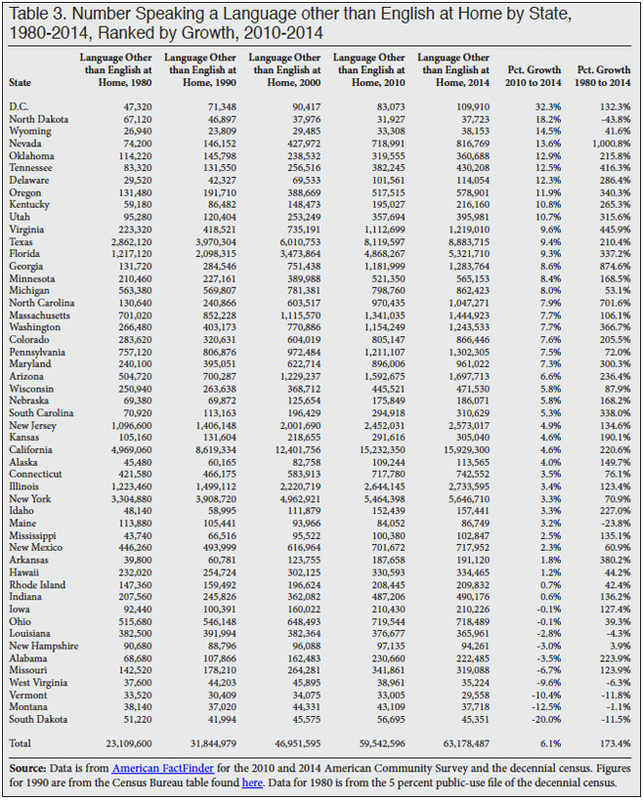 States with the largest percentage increase in foreign language speakers from 1980 to 2014 were: Nevada (up 1,001 percent), Georgia (up 875 percent), North Carolina (up 702 percent), Virginia (up 446 percent), Tennessee (up 416 percent), Arkansas (up 380 percent), Washington state (up 367 percent), Oregon (up 340 percent), South Carolina (up 338 percent), Florida (up 337 percent), Utah (up 316 percent), and Maryland (up 300 percent). Data Source. On September 18, the Census Bureau released some of the data from the 2014 American Community Survey (ACS). The survey reflects the U.S. population as of July 1, 2014. The ACS is by far the largest survey taken by the federal government each year and includes over two million households.2 The Census Bureau has posted some of the results from the ACS to American FactFinder.3 It has not released the public-use version of the ACS for researchers to download and analyze. However a good deal of information can be found at FactFinder. Unless otherwise indicated, the information in this analysis comes directly from FactFinder. There are three language questions in the ACS for 2010 and 2014. The first asks whether each person in the survey speaks a language other than English at home. For those who answer "yes", the survey then asks what language the person speaks. Third, the survey asks how well each person speaks English. Only those who speak a language at home other than English are asked about their English skills. The 1980, 1990, and 2000 decennial censuses (long form) asked almost the exact same questions. 1 Of the native-born who speak a language other than English at home, 10.0 million (36.1 percent) are under age 17; the remaining 63.9 percent (17.7 million) are adults. 2 Detailed information on the American Community Survey methodology, questions, and other topics on the can be found here. 3 FactFinder can be found here. 4 The Department of Homeland Security uses the ACS as the basis for its estimates of the illegal immigrant population. See Bryan Baker and Nancy Rytina, "Estimates of the Unauthorized Immigrant Population Residing in the United States: January 2012", Department of Homeland Security, March 2013.